From Complex to Blavity, it’s easy to view slideshows or scroll down photo galleries of Dapper Dan‘s most memorable remixing of the logos and patterns of iconic fashion houses Gucci, Louis Vuitton, and especially in the 1980s, MCM, on apparel both luxe and athletic and worn by stars of the decade. But Dapper Dan’s legacy is more than a who’s who of who he dressed during hip-hop’s original golden age. Reworking and giving the funk these world-renowned houses thought they did in their initial versions of monograms and silhouettes, Dan was a visionary in how he helped a community rise to the occasion of being or behaving nouveau riche. He is a self-made maven. More specifically, the local couturier that did amazingly good in the grander scope of influential fashion. In the 1980s, Stephen Sprouse and Willi Smith had a blast with colors and subculture. Yves Saint Laurent and Gianni Versace did not resist ostentatious details and sparkles, but household names like Giorgio Armani and Calvin Klein stuck to the classics that were tailored suits and neutral hues with the occasional burst of color in a collection. (Granted, the clothes were gorgeous. Armani famously dressed the cast of 1980’s American Gigolo, his brand suddenly on the American radar). Dapper Dan and his team at his East 125th Street boutique in Harlem, offered true innovation and further fun in fashion through ridiculously puffed out sleeves and logos as borders and templates on the front of a bomber jacket, pants, or sneakers. Sometimes a logo was the whole outfit design. Dan even re-created the logos themselves if he didn’t have an original garment handy to cut and sew. This was a style and creative license never really done before and the birthplace of this over-the-top ingenuity is in Manhattan’s always assertive neighborhood of Harlem where Dapper Dan (born Daniel Day) is from. Dan’s creations had just the right amount of sassy tackiness to make one go, back in 1986, “But where did you get it from?” ready to take down an address or phone number. Henri Bendel or Bloomingdale’s sure weren’t selling Gucci-fied trimmed jackets. Speaking of ridiculously puffed out (Louis Vuitton monogrammed) sleeves, such an outrageous accouterment to a fur coat in 1989, by Dan, and worn by Olympic gold and silver medalist Diane Dixon made social media headlines last week. Fellow New Yorker Dixon (of Brooklyn) roasted Gucci for not crediting Dan for one of their Cruise 2018 collection items in which a jacket with a fur front had interlocking G’s ballooned sleeves. Dixon posted a side by side comparison to her Instagram and the only difference? Dan’s sleeves were more voluminous. (Gucci thought they were slick too by putting the imitation on a Black model). Accusations of Gucci ripping off Dan ignited social media and while plenty enjoyed defaming the Italian house and came to the defense of the beloved Harlemite, there was also a bright pink elephant in the room within the controversy. Dan’s creations themselves, in regards to the labels he flagrantly used, were in all technicalities “illegal.” 28 years later, Gucci took an idea from Dan, in which Dan had used the LV logo and appropriated it without the house’s permission into another design for a client, and re-re-appropriated it. Nonetheless, again, it’s what Dan and his team did with the labels and clothes why many cried foul. Gucci might’ve indirectly tried to take back the power, but they couldn’t take the ideas with them. Dapper Dan re-imagined high fashion for a new generation, unapologetic about wanting a piece of the finer things in life. And through such a fresh, Promethean manner, a hard look at his trajectory would suggest crediting Dan in introducing streetwear as an important sector in fashion, as well as logomania, a real trend of casual wear in the 1990s. This past Sunday for the New York Times‘ reputable Sunday Styles section, Dapper Dan was featured as the front page profile. Coincidentally, the feature had been planned before Gucci was brought down with the “cut that check” gavel online. Headlined “The Fashion Outlaw Dapper Dan”, the feature by Barry Michael Cooper was a homecoming. Published twenty-five years after the closing of his namesake boutique in 1992, it was a warm look back at how Day became Dan. 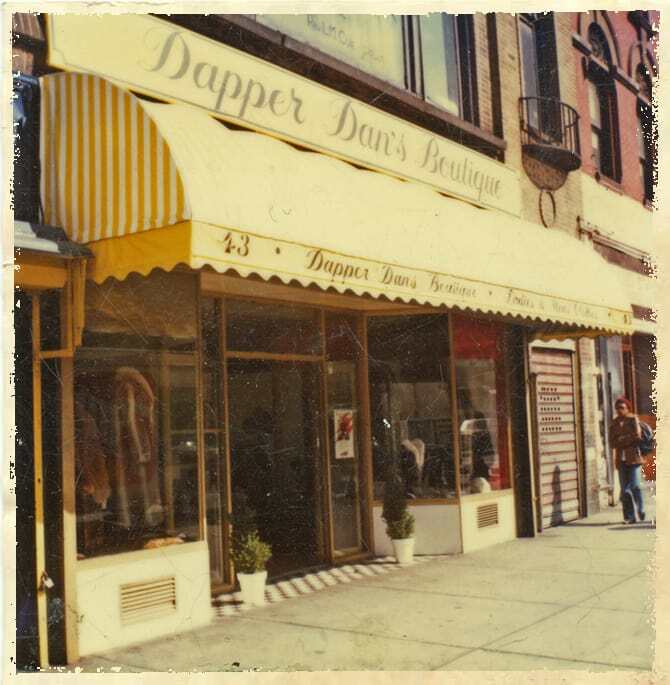 One of seven children, along with how his boutique came about, Cooper traced Dan’s humble Harlem roots. While Day had his days as a city hellion, opportunities to join an educational program sponsored by both the Urban League (a nonpartisan organization) and Columbia University, and a once-in-a-lifetime chance to travel to Africa and be an apprentice, were well seized. It was that trip to the Motherland that gave rise to the Dan we admire today. Kids of the 1990s likely heard of Dapper Dan through flashy magazines like VIBE or fashion segments on TV, present and vintage, where he was credited with making those customized high fashion logo-ed outfits for rappers and singers of hip-hop and R&B, today iconic artists in their field. Dan is not just an emblem of New York fashion. He’s a part of music history too. On the covers of two Eric B. and Rakim albums, 1987’s acclaimed Paid In Full and 1988’s Follow the Leader, the duo wore customized Dan. Salt-N-Pepa‘s famous yellow and red ensemble gear during their “Push It” explosion, and awesomely copied by Beyonce, her mother Tina, and daughter Blue Ivy for Halloween 2017, were by Dan. The Fat Boys, Jam Master Jay, Big Daddy Kane, LL Cool J, Bobby Brown also rocked mean Dan outfits in their prime, as did athletes and boxers like Mike Tyson, everyday people of the East Coast, hammy fashion lovers as far as Washington, D.C., and the most infamous drug dealers and boosters of the mid-to-late 1980s. 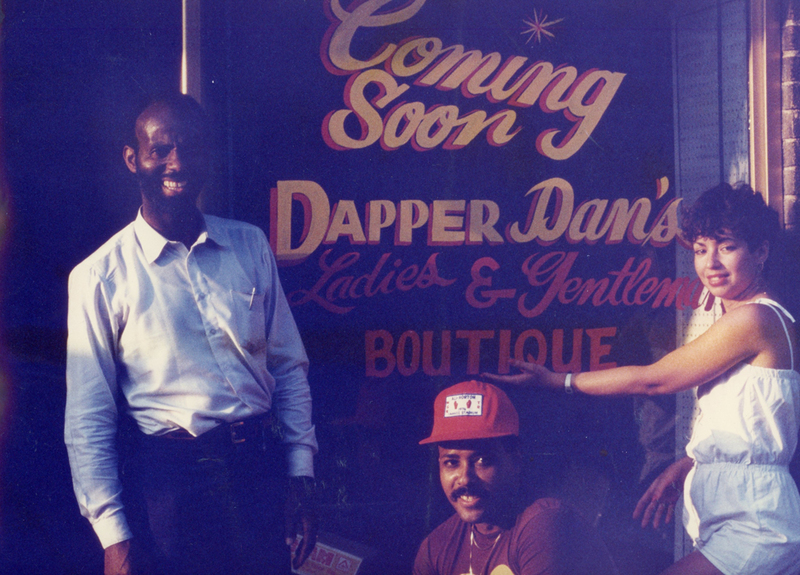 From 1982 to 1992, Dapper Dan’s Boutique was an underground phenomenon of New York fashion that had marked its own space in hip-hop and popular culture. What a time to have been alive. Or at least around to remember fashion in Day’s day. Previous Previous post: The Mysterious Case of Wendy Williams vs. Eileen D.